Spirits known as kachinas are central to the religion and mythology of the Pueblo Indians of the American Southwest, in particular the Hopi who live in Arizona. These groups believe that kachinas are divine spirits present in features of the natural world such as clouds, winds, thunder, and rain. They are also ancestral spirits that help connect humans with the spirit world. Each Pueblo tribe and village has its own distinct kachinas. There may be more than 500 in total, and all are equally important. The Pueblos revere the kachinas and look to them for help, especially in bringing rain to water corn and other crops. The kachinas dwell in sacred mountains and other sacred places. However, they spend half of each year living near Pueblo villages. During this time, the men of kachina cults perform traditional rituals linked with the presence of the spirits. They wear costumes and elaborate masks and perform songs and dances associated with specific kachinas. The Pueblos say that during these rituals each dancer is temporarily transformed into the spirit being represented. 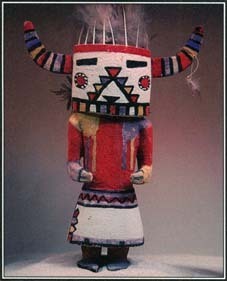 The Hopi and other Pueblo peoples use kachina dolls to teach their children about divine and ancestral spirits. These wooden figures are often elaborately carved and adorned; this one has horns and feathers. use these dolls to teach their children about the hundreds of different kachinas. See also Corn ; Kokopelli ; Native American Mythology .